On Tuesday, students, teachers, and parents gathered in the Franklin High School library to hear the school’s third annual poetry slam. Franklin’s slam is one of many taking place at local high schools this month in preparation for Verselandia!, the all-PPS High School Poetry Slam hosted by Literary Arts. The top two winners of each individual school’s slam will compete at Portland Center Stage on April 29 at 7 p.m. While volunteers in bright blue shirts handed out programs, Franklin student Sawyer Hiton strummed chords near the stage. Heads bobbing along to the acoustic music, the crowd settled into their chairs. Emma Childs and Jesse Gardner welcomed the audience to the event. Then Childs explained the rules. 1. Each poem must be of the poet’s own construction. 2. Each poet gets three minutes (plus a ten-second grade period) to perform one poem. 3. Penalty deductions are .5 points for each additional ten seconds. 4. The poet may not use props, costumes, or musical instruments. 5. Judges’ highest and lowest scores are eliminated, and then the other three scores are added together. In addition, the audience is encouraged to cheer and boo at the judges’ score. The judges were introduced: Laura Moulton, Marty Perez, Anibal Rivera, Dupree Stubblefield, and Julana Torres. Each judge gave a small wave from the table near the stage. Most of them teach at Franklin and had been selected by the FHS Poetry Slam Committee because of their passion for spoken word. Childs announced that along with a slot at Verslandia, the winner of the Franklin slam would receive a cash prize of $100. The second- and third-place winners would also receive a small sum. The first poet, nicknamed the “sacrificial poet,” was called to the stage. After the performance, judges held up yellow scorecards while audience members cheered the higher scores and jeered the lower ones. The music started up again while the mathematicians went to work. After scorekeepers recorded the final number on the whiteboard, the next name was drawn from the fishbowl and the first competitor took the stage. This went on for about an hour. After a short intermission of snacking on fresh veggies, hummus, and fried chicken sandwiches provided by Heidi Leinweber’s Foods & Communicare classes and SUN, the event continued for another hour. Students spoke about navigating family relationships, exploring the links between sneakers and consumerism, longing for connection, love, and more. Some used notes while others recited their poems from memory. All were incredibly poised and passionate. Most moved around the stage while they spoke, part-dancing or stomping or flinging their hands out, using body language to highlight their imagery and rhymes. The second half ended with special awards given by The Poetry Slam Committee and a closing word from the MCs. All in all, it was a terrific evening. Special thanks to Jan Donald, Sandra Childs, the Franklin Library Program, and their staff of volunteers for hosting, organizing, and promoting this wonderful event. 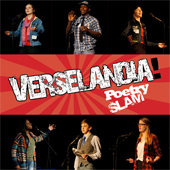 Literary Arts is looking forward to hearing all of the slam winners compete at Verselandia! on Tuesday. Tickets to Verselandia! 2014 are $10 online at www.verslandia.brownpapertickets.com.